- "High-fat diet ‘injures brain’"
Toss everything except coconut oil in a blender (I use a magic bullet type thing for this) and blend! Heat coconut oil to liquid, add, and blend! Be creative, add 2 tablespoons of cashew or mac nut butter for extra richness, make a creamcheese topping..
Heat oil in the dutch oven on medium high. (I have this dutch oven Costco Dutch oven but I wish I had this one Dream one )I use about 1/3 to 1/4 inch of oil. Turn the heat off, add the onion, bay leaves, garlic and broth. The broth should just cover the meat, there can be some meat sticking out of the top of the broth, but not a lot. Cover the pot and put it in the oven for 3 hours. Mix all the ingredients together except the oil and then make 1 meat ball and fry it in hot oil with the temperature on medium - medium low in the pan. Brown it on all sides, about 2 minutes each side. Try that meatball and see if you need to add anything to the mixture like more salt. We cook these in a really large stainless saute pan and cook them in batches of 6. Don't crowd the pan or they will not brown properly. Don't mix the meat and ingredients too much or it won't stay together in a ball. Our hosts Jimmy Moore and Mindy Noxon Iannotti share a fabulous conversation with friends Dan Pardi and Jimmy's wife Christine Moore in Episode 37 of Low-Carb Conversations with Jimmy Moore & Friends! Listen in as they talk about a column discouraging people from eating a Paleo-styled "caveman" diet and a thought-provoking piece on whether the Paleo diet is actually healthy or not. The special surprise appearance by Christine who adds her own unique contributions as well as Dan from "Dan's Plan" chiming in on the great work he is doing (including sharing some amazing low-carb recipes) makes this an episode you won't want to miss. 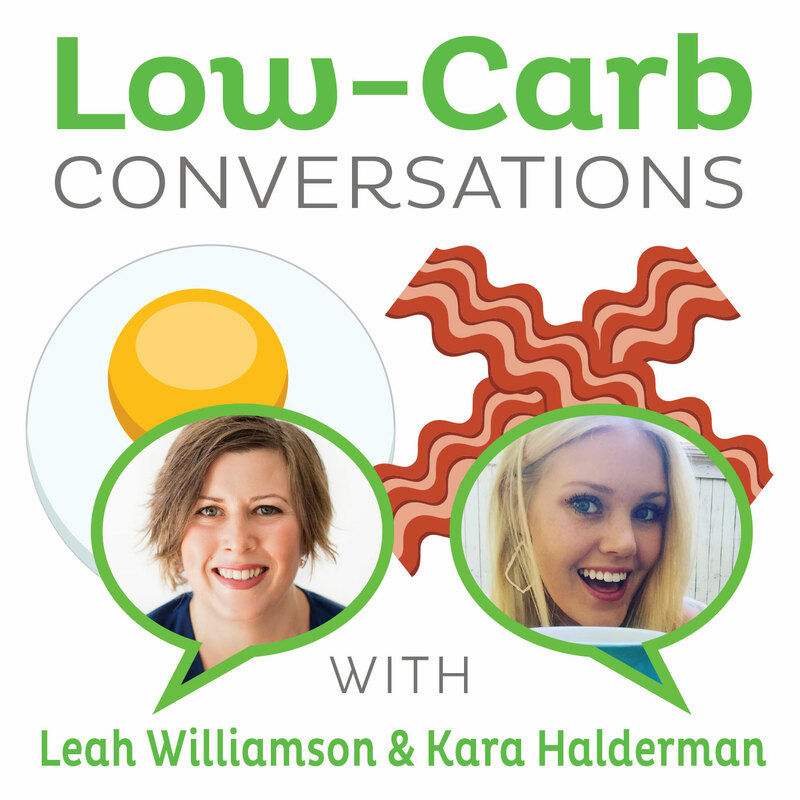 So pull up a chair, grab a cup of coffee and let’s talk about it on the Virtual Porch in the wonderful world of livin' la vida low-carb! - Dan Pardi from "Dan's Plan"
- "Don't Eat Like A Caveman"
- "The Caveman Diet: Is It A Healthy Option?" & pepper and knead together until well mixed. Scoop about 1/2 cup of the mixture at a time and form 8 - 10 patties. avocado, tomato and condiments to taste. 36: Alyssa Palomares and Barry Cripps on Childhood Obesity and More! - "'Stop Sugarcoating' Child Obesity Ads Draw Controversy"
- "Play your carbs right"
At the bottom of your mug, mix together the dry ingredients. Add the coconut oil or cream and stir into a paste. Add enough boiling water to cover the paste, and stir before adding remaining water. If desired, top with whipped cream. It is VERY important that you do not pour all the water into the mug at once, otherwise it won't mix neatly. I should note that this recipe was intended for a toaster oven, but it can be adapted for a regular oven. The original recipe was supposed to be microwaved, but that might dry out the brownie. The texture is more like a cake instead of an authentic brownie, but I'm not sure how to fix that. Some people might consider it dull by itself, so feel free to give it a frosting, mix in some chocolate chips, put low carb ice cream on top - whatever you like! I wanted to give measurements for making multiple servings, but I'm not sure how that would affect the cooking time. I did increase the measurements to make two brownies once, but I don't remember how much I had to adjust the time or if I had to. Sorry if this is inconvenient! I know how inefficient it might be to heat up a regular oven for just one brownie. -3 tbsp butter OR coconut oil, softened - or you can use a mixture of both! Preheat oven or toaster oven to 350 degrees Fahrenheit. In a bowl, mix butter/coconut oil with the sweetener thoroughly. Add egg, and beat. Alternate between adding the coconut flour and coffee (in that order), 1 tbsp at a time. Add cocoa powder and vanilla extract, and mix thoroughly. Pour batter into a ramekin and put in the oven for 15 minutes, or until a toothpick inserted in the center comes out clean. Alternatively, you can scoop the batter onto a cookie pan lined with aluminum foil to make pancakes. It might also work if you put the batter in a skillet, but I haven't tried that. Today Jimmy and Mindy welcome Lori Reed and Mike MacDonald to Low-Carb Conversations With Jimmy Moore And Friends! So pull up a chair, grab a cup of coffe3 and join us on the Virtual Porch for another excellent low-carb gabfest! - "Lose Weight. Regain It. Blame Hormones?" - "The problem with healthy fats"
- "Ohio puts 200-pound third-grader in foster care"
- "Why low-carb diets are a bad idea"
Today Jimmy and Mindy are joined by Scott Milford and Jerome Biggars as they discuss getting cheesed off by cheese, pizza as a vegetable and much more! So pull up a chair, grab a cup of coffee and sit a spell on our Virtual Porch as we chew the fat on another great episode of Low-Carb Conversations With Jimmy Moore and Friends! - "USDA Wants Potatoes Out Of School Lunches"
- "The Grim Reaper Wears a Cheesehead: Billboard Warns Packers Fans of Obesity Risk"
- "Physicians group removes Cheesehead from anti-cheese billboard"
hot and bubbly. Let stand 3 minutes before serving. tomato & basil Pasta Sauce which is a zero carb, zero calorie sauce! 1. Raise oven rack. Preheat broiler. 2. Line bottom of broiler pan with foil. Spray top lightly with Pam olive oil spray. 3. In a small bowl, mix together the Parmesan cheese, butter, mayonnaise, and all seasonings EXCEPT Old Bay Seasoning. Add lemon juice to achieve desired consistency. Mix well and set aside. 4. Arrange fillets top-side up on the prepared pan. Sprinkle top side with Old Bay. 5. Broil a few inches from the heat for 2 1/2 minutes. 6. Flip the fillets over, sprinkle with Old Bay, and broil for 3 more minutes. 7. Remove the fillets from the oven, flip them, and cover them with the Parmesan cheese mixture on the top side. 8. Broil for 2 1/2 more minutes or until the topping is browned and fish flakes easily with a fork. Be careful not to overcook. 1. Pour a little olive oil into a Ziploc sandwich bag. Press out all the air from the bag to ensure that the oil coats the inside of the bag. 2. Open bag and drop in several pieces of pork rinds. Seal the bag and shake until pork rinds are coated. Remove the pork rinds and set aside. 3. Using a clean Ziploc bag, dust the inside of the bag lightly with cinnamon and your artificial sweetener of choice. 4. Drop the oil-coated pork rinds into the bag. Seal and shake bag until the pork rinds coated with cinnamon and artificial sweetener. grated cheddar cheese on top. Hope you like it! 31: Bryan Davis and Lynn Weiler on Why DIets Fail, Orange Juice, Paleo Coffee and More! - "Diets fail because advice is wrong, say researchers"
- "The Secret Ingredient In Your Orange Juice"
Bryan's Pro-Biotic Ginger Bug, a recipe that is super simple and can heal / restore health! 2 teaspoons grated ginger root (skin and all). 1 cup of spring or filtered water (not straight tap water). Stir these ingredients in a cup (mason jar is best). Every day or 2 add the same amount of ginger and sugar (and water as necessary). This will start to bubble, then you know it's active and consuming the sugar. You just pour a bit (spoonful) of the liquid into a glass of your drinking water, or any cool beverage really. You'll be consuming just a tiny fraction of a teaspoon of sugar, but you're getting a healthy dose of probiotics. This liquid can be used for many many purposes. Even making your own ginger ale (or ginger beer as it is called). 4 large 8 inch banana peppers..washed,topped, cut lengthwise and seeded. While that is baking, saute some coconut oil or butter in a pan with about a pound of sliced mushrooms and 8 diced roma tomatoes. Add 1.2 t basil and a pinch of oregano, salt and pepper, or what ever spices you love on pizza. When the peppers some out of the over, put two on a plate, spoon the tomato mixture on top and then cover with parmesan cheese and mozzarella cheese. I stuck them back in the warm oven for a couple minutes and wow...I will never miss a pizza crust again.